SYRIA-born builder Mohamad Ouzoun feels guilty for living in New Zealand - because his twin sister, Rasha, and her children cannot leave their house without fear of being molested. 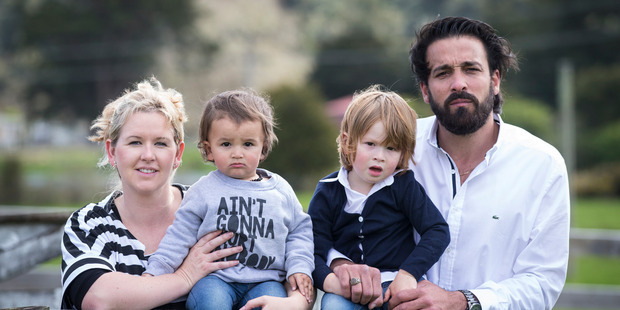 Mr Ouzoun, 33, lives with his Kiwi fiancee, Michelle Davies, and their two boys, aged 3 and 1, in peaceful rural paradise on Ms Davies' parents' lifestyle block just north of Auckland. Meanwhile, Rasha has been living through hell. Her first husband was killed in the street in the Syrian capital, Damascus, leaving her alone with three children. She remarried and had a fourth child, only to see her second husband killed too. She fled with the children to Jordan but has had to marry off her eldest daughter at just 14 so that the family has a man to call on when they go shopping or go out for any reason. "People are hassling her and trying to knock the door at night-time and try to do stuff to her," her brother said. "If they walk out they try to touch her and touch the kids. "The little girls can't go to school. Now they have been three years without school because when they walk to school in the morning people grab them. It's really hard to explain those things." The family received a small living allowance from the United Nations at first, but the UN ran out of money and stopped paying them 18 months ago. Now Mr Ouzoun and his brother Alaa, who is also a builder in Auckland, pay their sister's rent and living costs. Mr Ouzoun visited her last year and said: "My heart broke. They were sleeping on the floor. They have no life at all. "They've got no fridge, they've got no light. I had to go and get them beds and stuff." He has applied to Immigration NZ to bring them here under the increased Syrian refugee quota. But he has not heard back yet, and was disheartened when the agency refused a visitor's permit for his 66-year-old father, who is now alone in Syria, to attend the wedding which he and Ms Davies had planned this year. They have postponed it hoping that eventually more of Mr Ouzoun's family will be able to attend. He is pleased that Herald readers have donated more than $1 million to help World Vision support Syrian refugee children. "It's the best thing to help those people in Jordan or Lebanon," he said. But as a twin, he feels a special bond with his sister. "At night-time I wake up crying, 'She's not safe'," he said. "This feeling I have, this emotional feeling. I sleep with the phone on beside me all the time in case of someone calling because I accept any time I will have a bad call for them or for my dad. "When I'm eating I feel bad because I know lots of people back home, my family, are not eating like we eat here.